We have a variety of class times and venues to fit your schedule and location. To schedule a private studio class, please call Alvaro at (512) 250-5451, or send him an email. 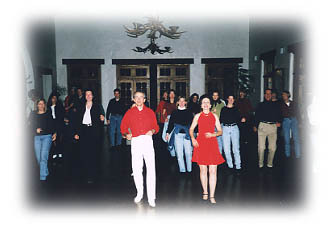 Private classes and workshops are available in Salsa, Merengue, Bachata, Cumbia, Cha Cha and Argentine Tango. We are also available for dance shows and performances at private parties, conventions, meetings, and seminars. If you would like to be added to our mailing list to receive information on upcoming workshops, please send us an email and include your special areas of interest.